Art Not Oil, Liberate Tate and Platform have produced three audio downloads offering the listener alternative guided tours through the Tate galleries showing the effects of financial sponsorship by BP on those cultural institutions. 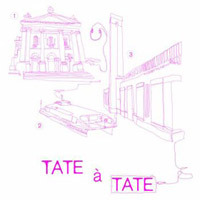 People can listen online or download the audio tours for free onto an MP3 player and listen through headphones while being guided through Tate Britain, the Tate Boat Thames taxi between Tate Britain and Tate Modern, and Tate Modern. Drilling the Dirt, at Tate Modern, by Phil England and Jim Welton.